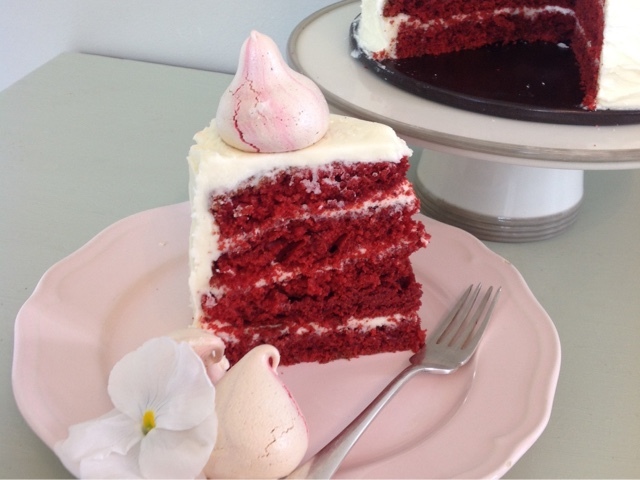 The red velvet cake is an absolute showstopper, there are a few steps to preparing the cake but I think if you get yourself organised before you begin you can't go wrong. Begin by pre heating your oven to 160"c.
In your food mixer cream together your butter and sugar until pale and light. Next in a small bowl whisk together the eggs and pour into the mixer, once the eggs have combined with the butter pour in the two bottles of red food colouring. In a separate bowl add in all your dry ingredients and gently whisk together. Turn off your food mixer and slowly pour in the dry ingredients then the buttermilk and turn on the mixer on a slow setting so no one gets covered in a flour cloud!!! While that's mixing combine the vinegar and baking soda in a small bowl it will bubble up which looks super for any of your Minnie bakers watching on. Pour this in your batter and let it mix before turning off the mixer. You can either line your cake tins with baking parchment or spray them with cake release spray before evenly dispersing the batter into them. Pop them in the oven on the same rack and bake for 40mins. While the cakes are baking make the cream cheese frosting, add all three ingredients into your mixer and beat until white, smooth and creamy. 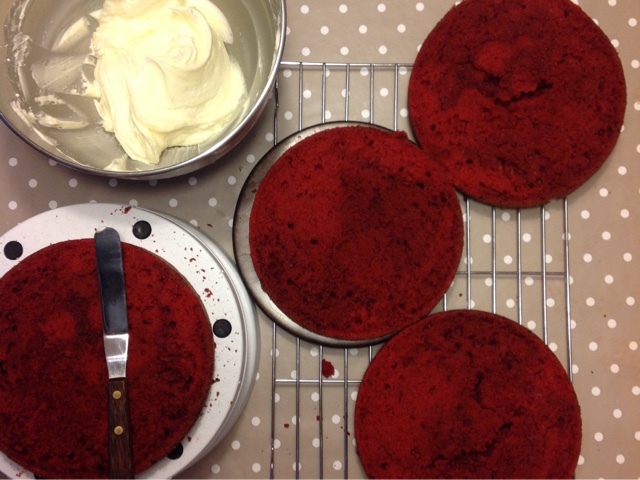 Once the cakes are baked fully take them out and let them cool on a cooling rack. When they are fully cooled you can now carefully divide them into four layers, you do this by using a serrated knife like a bread knife. Insert it in the side of the cake making sure it is level, then slowly using long movements cut along the cake to the left gently turning the cake to the right as you cut. Now that you have four layers of your cake it is time to assemble. Put the first layer of cake on your plate or cake board and dollop a small amount of the frosting on the cake and spread evenly over the cake. Place the next layer of cake onto the frosted layer and repeat this process until the four layers are on. 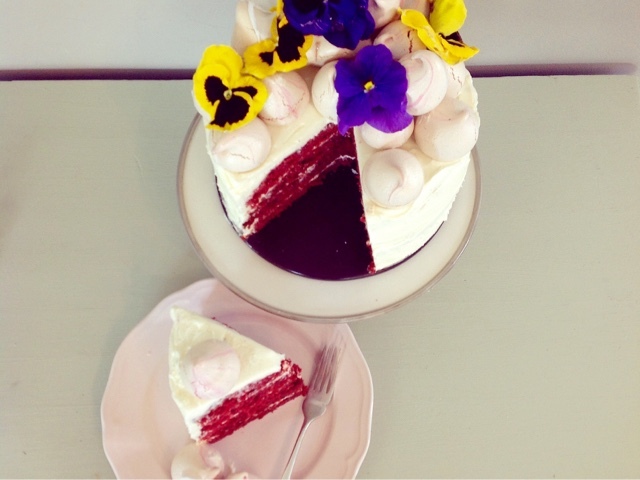 You can leave the cake as it is and just add a generous dollop of frosting on top or you can cover the cake fully with the frosting using an off set spatula, you do this by taking the frosting from the top of the cake and bringing it down to the sides of the cake then spreading evenly.